Today’s in my kitchen ..
2. Fry the cashew nuts, almonds, raisin and remove. 3. Lightly roast the semiya till golden and remove. 5. Add the vermicelli and mix well. 6. Simmer for 10 minutes and add sugar. 7. 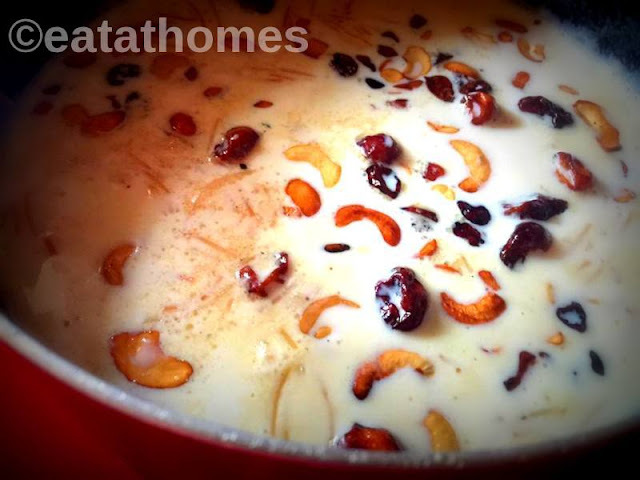 When it starts to leave the sides of the pan, add cashew nuts, dates and almonds. 8. Add cardamom powder and mix well. 9. Remove and serve in small bowls. 10. Drizzle some condensed milk.